Marinade the seabass in salt, pepper and olive oil for at least a half hour. Then, wrap the fillets with the vine leaves. Boil the black beans until al dente point and let cool. Wash and dice the vegetables. In a non-stick pan, sauté all the vegetables in olive oil. Add the raisins and beans and drizzle over the wine. Season to taste, and transfer the vine-leaf wrapped fish (skin-side down) on top. Cover the pan with a lid and simmer on low heat for about 6-7 minutes or until the fish is tender. Use vegetable broth if more liquid is needed, so as to avoid it sticking to the pan. 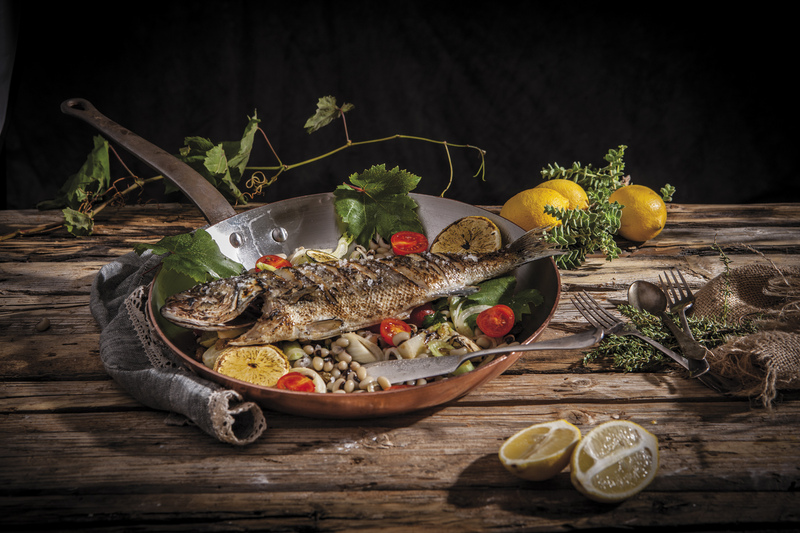 Serve the vegetables on a large shallow plate and the seabass fillet on top. Complete the serving by sprinkling a few drops of olive oil and a bit of lemon grating to add aroma and some extra flavor. An alternative to cooking the seabass would be to place the fish in the oven at 180⁰C, increasing the time by 12-15 minutes, depending on the oven as well as the size of the fish. The same dish can also be prepared with grouper or sea bream instead of seabass.